Permaculture is an illusive concept. Just when you think you have it figured out, the meaning seems to shift on you. The fact of the matter is the meaning of all words can change over time, and permaculture is no exception. Its origins date back to the early seventies in Australia where its original meaning had everything to do with creating “permanent" agricultural systems, or food production systems that were resilient enough to weather the course of time. How does a system do this exactly? By following nature's own rules. Nature recycles everything, creates no waste and builds ever more stable systems by incorporating diversity and complexity into its design. Early on in the creation of permaculture philosophy, it was clear that a set of guiding principles were needed, and by and large, 12 principles of permaculture have been adopted as guidelines for permaculture design. In addition, three ethics are used in permaculture; Earth Care, People Care, and Fair Share..
Over the course of the last 40 years, permaculture has come to mean more of a “permanent culture" as opposed to a "permanent agriculture," with these principles and ethics being core to this expression. So now you get the sense of the complexity. Permaculture can be applied to anything: food production systems, building design, municipal planning, educational systems, etc. Systems that implement these principles are expressions of permaculture, whether they use the word of not. For example, the highly managed food forest systems that existed in the Americas before the arrival of Europeans were perfect examples of permaculture. Some of the current day "Transition City" projects that are happening globally would be considered permaculture. 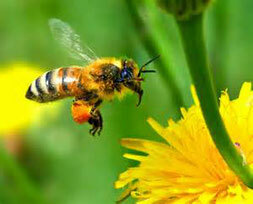 A garden that is to some degree self-fertilizing, pollinating, and mulching would be considered permaculture. Recently, I asked a few teens what they thought the word meant. I did this fully realizing the challenge of the question. One teen immediately chimed in, “it's like something that sustains itself without much help. Like an ecosystem." Then his friend added, "It's when we do things that are good for the Earth, but they are also good for us." If only adults could be so clear, and not get caught up in the details. If we make a positive footprint, we are regenerating the Earth's biological systems. We are building resilience, and we are creating tremendous yield for humans as well. This is the largest implication for permaculture. We shouldn't minimize our human footprint. We should make huge footprints and from them should grow food and flowers. 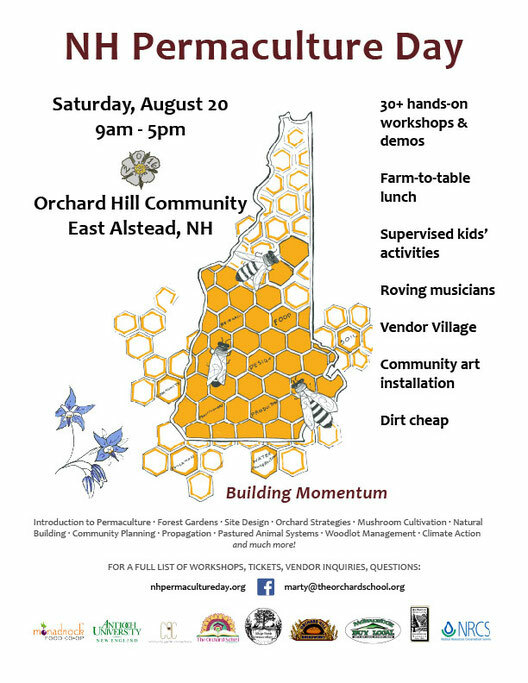 To learn more, join a growing group of people that are using permaculture to maximize their own yield (be it food, fire wood, fodder, etc) at the 2016 NH Permaculture Day at Orchard Hill, East Alstead, NH on August 20th. This will be a full day of workshops, vendors, music and more. We will also provide a farm to table lunch and activites for childen. If you wish to volunteer or vend contact marty@theorchardschool.org. Tickets are $25 if you order on line by August 6. Kids are free. Hope to see you there!